OMEGA Strap Duplicators or sometimes known as Hole Finders eliminate the guess work when drilling a hole in one layer of sheet metal that needs to match up precisely with an existing hole in another layer. Using an OMEGA Hole Finder is simple: Fit the pilot pin to the existing hole and drill through the guide hole of the other strap into the new material and you will have a rivet ready match. The end of the handle on the OMEGA Strap Duplicators doubles as a convenient tool for prying sheets if metal apart. The OMEGA 6001-1EL #40 Standard Bushing Style Strap Duplicator Hole Finders is one of thousands of quality tooling products available from MRO Tools. Please browse Strap Duplicators, Kits for tools similar to the OMEGA 6001-1EL #40 Standard Bushing Style Strap Duplicator Hole Finders. 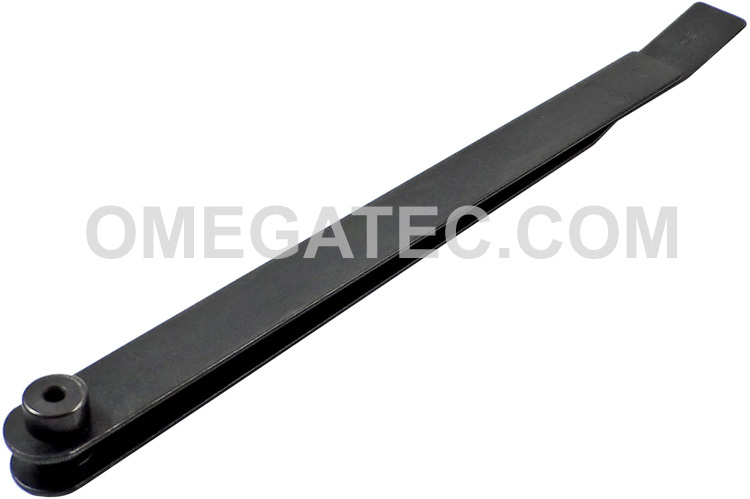 OMEGA 6001-1EL #40 Standard Bushing Style Strap Duplicator Hole Finders description summary: OMEGA Hole finders eliminate the guesswork when drilling a hole in one layer of sheet metal that needs to match up precisely with an existing whole in another layer. Length: 13 1/2'' Throat Depth: 11'' Size: #40 Quantity discounts may be available for the OMEGA 6001-1EL #40 Standard Bushing Style Strap Duplicator Hole Finders. Please contact MRO Tools for details.